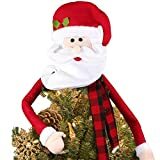 This holiday season, top off your Christmas tree in a stylish and dapper way with this cool new Top Hat Christmas Tree Topper. 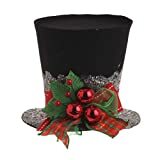 This whimsical top hat for a Christmas tree or a really massive giant is made from black flocked polyester with a festive velvet bow and pom pom accents. Now if this jolly top hat does have some magic inside, like Frosty the Snowman's, don't be surprised if your Christmas tree comes to life and rolls out the front door screaming for help. Hmm, that actually might be quite entertaining to witness. 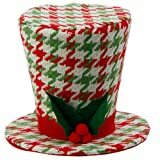 Get a top hat to top off your Christmas tree this year.